The Pentagon is the world's largest office building by floor area, with about 6,500,000 sq ft (604,000 m2), of which 3,700,000 sq ft (344,000 m2) are used as offices. To put the structure in perspective, the Pentagon is almost as wide as the Empire State Building is tall. The Pentagon is the headquarters of the United States Department of Defense and located in Arlington County, Virginia just over the Potomac River from Washington, D.C. As a symbol of the U.S. military, "the Pentagon" is often used metonymically to refer to the Department of Defense rather than the building itself. Designed by the American architect George Bergstrom (1876–1955). Ground was broken for construction on September 11, 1941 and was dedicated on January 15, 1943. Approximately 23,000 military and civilian employees and about 3,000 non-defense support personnel work in the Pentagon. It has five sides, five floors above ground (plus two basement levels), and five ring corridors per floor with a total of 17.5 mi (28.2 km) of corridors. Original plan requirements for the building were that it be no more than four stories tall and use a minimal amount of steel due to war-time rations. The requirements meant that, instead of rising vertically, the building would be sprawling over a large area. Possible sites for the building included Arlington Farm, adjacent to Arlington National Cemetery, and the obsolete Washington Hoover Airport site. 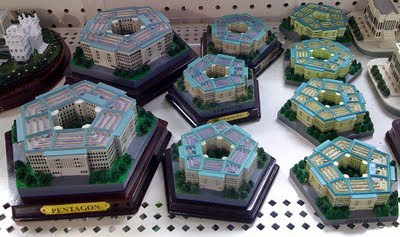 The pentagonal shape of the building was a result of the shape of Arlington Farms, which was the site originally chosen; however President Roosevelt ended up selecting the Hoover Airport site, as he did not want the new building to obstruct the view of Washington, D.C. from Arlington Cemetery. But the building retained its pentagonal shape because a major redesign at that stage would have been costly, and because Roosevelt liked the design. Freed of the constraints of the asymmetric Arlington Farms site, however, it was modified into a regular geometric pentagon shape. On September 11, 2001, exactly 60 years after the building's groundbreaking, hijacked American Airlines Flight 77 was crashed into the western side of the Pentagon, killing 189 people, including five hijackers, 59 others aboard the plane, and 125 working in the building. Souvenir building replicas of the Pentagon building range from a large Banthrico coin bank to a very small contemporary pewter replica. Many sizes and versions of made of resin are also currently available in D.C. area gift shops.